Socks a La Carte - create original sock designs! This stately cuff handsome look ensures this cuff will stand out, and the ribbed construction means it’s functional as well. Note: Work this st patt over a multiple of 8 sts. Cast on 64 sts. Divide sts on 2 circular needles, 32 sts on needle 1 and 32 sts on needle 2. Join, being careful not to twist. Place marker at beg of rnd. RND 2: *K1, yo, k2, sl1-k2tog-psso, k2, yo; rep from * to end of rnd. Rep Rnds 1–2 a total of 8 times. Purl 2 rnds. 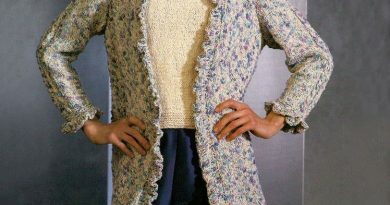 Eyelets create a delicate lacy look with simple stitch patterning. 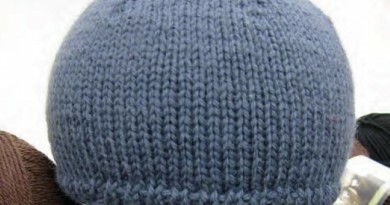 Four easy-to-remember rows make this an easy pattern that looks a lot more complex than it really is. Note: Work this st patt over a multiple of 8 sts. Begin with 64 sts. Place marker at beg of rnd. 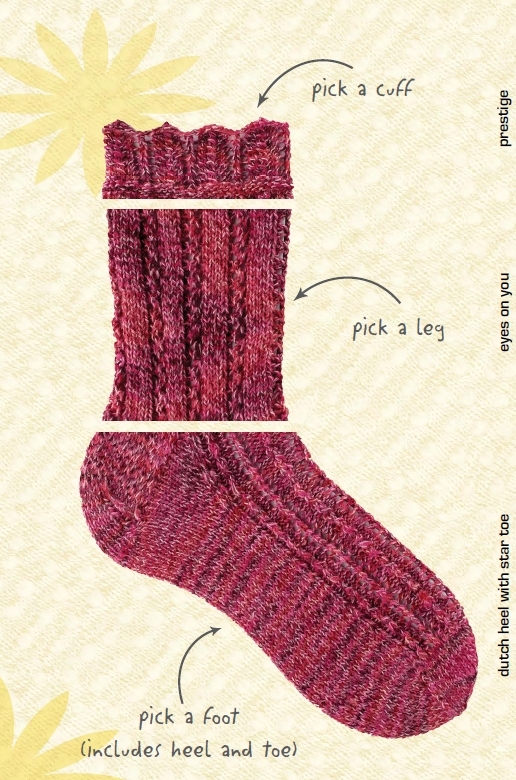 Rep Rnds 1–4 until sock measures desired length. ROW 1 (RS): *Sl 1, k1; rep from * to end of row. ROWS 2 & 4: Sl 1, purl to end of row. 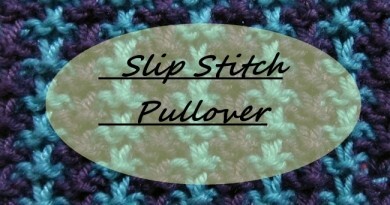 ROW 3: Slip 1, *Sl 1, k1; rep from * to last 2 sts, k2. Rep Rows 1–4 a total of 8 times. ROW 1 (RS): K21, SSK, turn. ROW 2: Sl 1, p10, p2tog, turn. ROW 3: Sl 1, k10, SSK, turn. ROW 4: Sl 1, p10, p2tog, turn. Rep Rows 3–4 until 12 sts rem. sts, k2tog, k1. Working with needle 2, work in patt. RND 4: Work in patt. Rep Rnds 3–4 until 64 sts rem. Work even until foot measures approx 2″ (5cm) less than desired foot length. 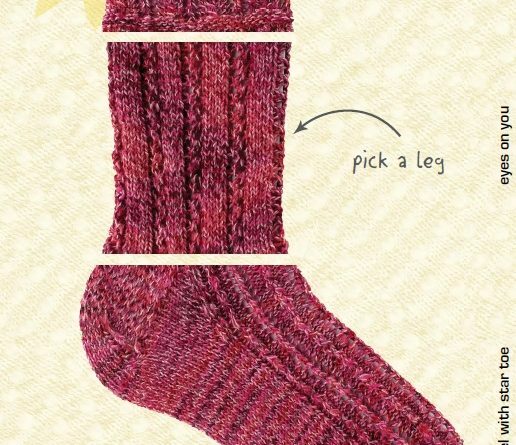 Note: Divide sts carefully to ensure correct placement on each sock. RND 3: On needle 1, knit to 2 sts before marker, k2tog, knit to last 2 sts, k2tog. Rep on needle 2. Rep Rnds 3–4 until 36 sts rem. Work Rnd 3 every rnd until 8 sts rem. Graft toe using Kitchener st.